Public Open Days in 2019 Details and booking information about Public Open Days for the first half of 2019 are available at Ticketsource. Newsletter 1: Project status, fund-raising events, Pope and gardening and the fate of Pope’s Skull. Newsletter 2: The status of our conservation project,our last symposium, other local grottos and the ‘Nine Ladies of Crux Easton’. Newsletter 3: Our recent Heritage Lottery grant, laser-scanning the grotto, the second Grotto at Marble Hill House and “The Residence of the Muses”: a paper on 18th century literary life in Twickenham. Newsletter 4: Completion of the conservation and lighting of the South Chamber and an article on “Pope’s mortal blow”. Newsletter 5: Changes to the conservation plan, recent fund-raising events and open days, our plans for the 300th anniversary of Pope’s arrival in Twickenham, a tragic event in Stanton Harcourt and an abbreviated transcript of a talk by Dr Emrys Jones “an ornament from an inconvenience”. (the full text of Dr Emrys Jones talk “An Ornament from an Inconvenience” can be found here). You can keep informed by subscribing to our email list here. This is an article about the restoration project in the Daily Telegraph (15th September 2015) by Victoria Lambert: “Inside Alexander Pope’s hidden grotto”. 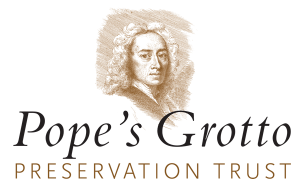 Read this article from the Observer (8th May 2016) about our project: “Hope springs eternal: project to save Alexander Pope’s secret grotto”. Hyperallegenic, an online magazine based in New York, has a good article about us here: “Restoring Alexander Pope’s Glinting Grotto to Its Former Glory”. A couple of articles about our project have been published in 2 local magazines, not available on the web: The Friends of Tabley House (Cheshire) Newsletter February 2016, and An Baner Kernewek (The Cornish Banner), August 2016. The latter is a long-standing Cornish cultural magazine. The connection with Pope’s Grotto is made via Dr William Borlase of Ludgvan, who supplied Pope with Cornish minerals for his last building phase. Historical novelist, Lucy Roeber, has written and excellent article on the grotto in her blog: “The Season of Grottos”. Well worth reading.